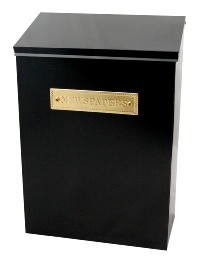 A large capacity newspaper box designed to take multiple/ large newspapers, keeping them safe and dry. The unit can also be used for general post, magazines or small parcels. This unit does not have a lock so the items can be retrieved by simply lifting up the lid. The unit comes with an electroplated bronze “Newspapers” plaque on the front.